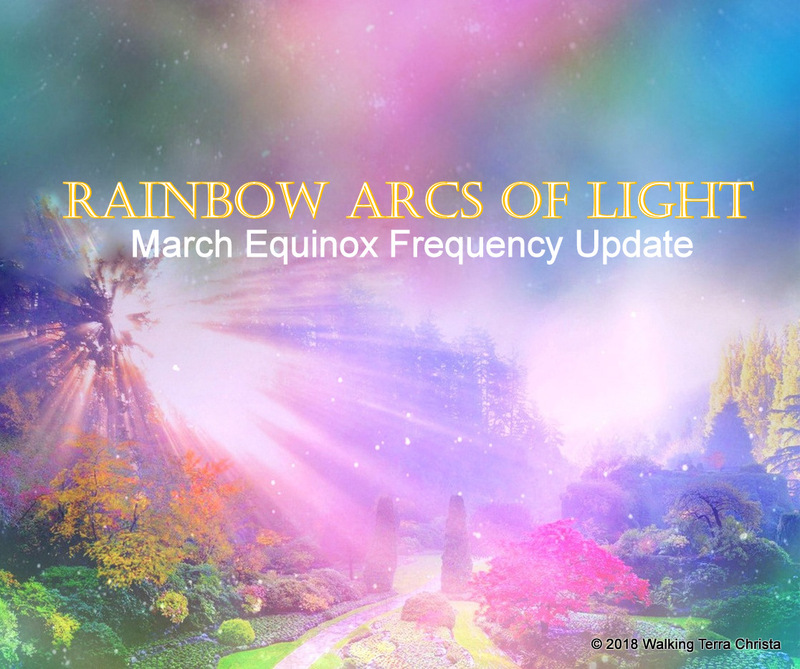 Frequency Update Ascension Mastery Message for the Equinox of March 2018. Channeled transmission by Rev. Christine Meleriessee of Walking Terra Christa. We are the Unified Whole Command of Master Thoth, the Great Divine Director, and Master Einstein bringing forth the Divine Light of the 144th dimension within the Creative Source of Oneness. It is at this time that the Earth is preparing herself to receive more assistance of light with the oncoming energies of the March Equinox and the upcoming Ascension Festivals of Light for the next three months. There has been great change occurring within the planet as you are seeing awareness’ of life living upon the earth must come into a new state of existence. Souls are awakening to these elements within themselves, but the progress is very slow within the 3rd and 4thdimensional constructs. For those of you that have stepping unto the Pathway of Mastery, allowing your physical vehicle to be resurrected unto the higher planes of existence, are feeling these energies at a much more increased rate of vibration within your four-body system (physical, etheric, emotional, and mental). The changes that are occurring presently are preparing each of you to step into a new part of your awareness that you have not been able to experience during any other lifetime. The moon cycles within this year are allowing for the light infractions to blend within each individual that will assist them to readjust their energetic bodies. The Solar Flares that are presently occurring are bringing forth the existence of more light fluctuations in the entire structure of the earth. What happens through this process is that elements can be very turbulent especially for the ones that cannot handle the change within their consciousness. You have seen this very strongly within your political arena and what has happened with tragedies concerning guns and children. A new awareness is occurring within each of you, and it is your decision within your physical consciousness of how you are going to assimilate the data that you receive through these energetic movements of light. Yes, we say Light as we want you to understand that in many cases upon this earth tragedy has had to occur in order for people to wake up to the reason why it happened. Unfortunately, lives have been lost in the process, but please understand within yourself that it is not a loss completely as elements are being put into place to allow for a true healing to occur on many deep levels for all upon and within this Earth. As the planet moves closer to the Spring Equinox, it is preparing within its foundation to bring forth an existence of life quite differently than has occurred in any other time period. The preparation of this energy is one that the earth has been in training for eons of time and the result of the influctuation of light will help to remove the elements that have stopped the re-creative process to occur from the higher dimensions. In 2017 during the Solstice the Great Central Suns of the Solar, Galactic, Universal, Multi-Universal and Cosmic came together to unite with GAIA, assisting her transitional journey which is a great alliance that occurred. This continues through each month especially during the New and Full Moon Cycles. Planetary alignments are coming into focus like no-other year within the existence of the Earth. The Solar flares are actually assisting in bringing forth the Electro-Magnetic energies in a new way of understanding. Each of you know that the Masculine/Feminine Divine Essence is a major component to bring forth balance into the re-creation of the planet so when these solar flares come shooting directly into the planetary existence of the earth then there is a huge movement of restructuring that occurs. These stages of preparation will continue for some time within and around the dimensional levels of the earth so that full alliance can happen between the Masculine Divine energies in the foundation of the crystalline structure within Gaia. You have seen some of these occurring within the consciousness of individuals, but we have a very long way to go with the higher light forms becoming the global consciousness. It has to start very small and grow incrementally. During this Equinox of Spring in the Northern Hemisphere and Autumn in the Southern Hemisphere the light formations will become stronger to help align what has already been put in place by the Great Central Suns since 2017. It will assist in bringing to each soul light formations of Elecro-Magnetic pulses that will assist the biological structures to become aligned with the Creative Source of Light. What does this mean for you as an awakened soul in the physical body? This new light surge,called RAINBOW ARCS OF LIGHT, will push the density of the planet to become more crystalline through the consciousness of humanity. It will filter into each individual soul planted upon the earth and will help to bring to the surface what has been hidden. Now this process will be very slow and within humanity, you may not see much at first. But that is not the reason for this message. It is to let each of you know, the souls that have been awakened, that are working on the Ascension Pathway of Mastery, that you will be assisted in a much more direct manner than you are already experiencing. The time is here to assist the awakened souls, the Light Workers, to realize within themselves that they have a grand opportunity to allow these levels of the Solar Level to bring unto them a new phase of Resurrecting their Soul’s Essence, to bring forth the ability to realize within themselves that the process of healing is an essential component to their full enlightenment. Each of you, as these souls, should come to new realizations within your own healing process, of what is working, what is not, and what you can do to make changes within yourself by allowing your I Am Presence to be your guide, not just in words, but through the energetics of this Equinox. We are at a huge GATEWAY OF LIGHT unto the planet in which each individual soul is being assisted by allowing these light infractions to help them make the necessary changes within themselves. Are you ready to experience your Divine Light Within You to be manifested in a new and different way? You cannot experience these energies through any of your lower systems. This means it must be acknowledged through the Feminine Divine of the Higher Emotional Body, the Masculine Divine of the Higher Mental Body, allowing the Etheric Body to be infused with light elements from the Great Central Suns which will in turn allow your Physical Vehicle to be motivated and changed on a deeper level than you are experiencing presently. This means that energetically it is a very powerful time and that whatever state of awareness you allow yourself to be will affect how your Physical Self will assimilate the energies within you. Every person who wants assistance with this light frequency in a positive manner must adhere to the higher realms of the Masculine and Feminine Divine that is part of their I AM Presence. This means learning to know what issues are bothering you presently so that the Great Central Suns can help you to resurrect them into the pure perfection that you can be. The intensity of the light energies will ignite from March 20th at 16:15 UTC (9:15 AM Pacific, 12:15 PM Eastern) through the Full Moon of March 31st, 2018 at 12:37 UTC (5:37 AM Pacific, 8:37 AM Eastern). This is due to the fact that March 31st Full Moon is the 1stAscension Festival of Light representing Resurrection and Regeneration. The Great Central Suns have come into the realization that it is important to allow these light infractions to be received by every Awakened Soul that chooses to experience the Highest Light Quotient within their full consciousness that is available through their four-body system (Physical, Etheric, Emotional, Mental). It is important to realize that preparation must be done so that each of you are able to experience your Divine Light and not the lower form of third dimensional elements that are held within our Etheric Soul Body from many timelines that do not allow for the higher light infractions to occur. This means that during this cycle you may be able to heal some of those particles within your Subconscious Mind that are stopping you to have full realization of your Christed Self. You will be assisted incrementally by the Light Forces in a much more direct manner than you ever have before. Don’t you want to heal those ascension symptoms you feel in your physical body? They are stemming from elements lodged within your Etheric Soul Body that need to be healed within your full body system. As your awareness grows within you, then the physical body can hold back the process of restructuring that occurs. This is a Divine Opportunity to step into a new state of awareness by allowing each of us, the Unified Whole Command with the Great Central Suns of the Solar, Galactic, Universal, Multi-Universal and Cosmic to fully assist each of you to step further into your pathway of Ascension Mastery. This is an accelerated time and the way that you can ground these energies to become you instead of just feeling them, being upset by what you are experiencing, or not understanding the process. Your role is to not understand from the Physical Self but to allow your Higher Consciousness to assist you through the Gateway of the March Equinox. Those that choose not to go deeper within their own etheric self will be challenged in many ways because this energy is arriving into Gaia, we cannot stop it, nor do we choose to do so. We hope you will feel the same. You may experience many levels of uncomfortability as this exchange of light is quite different than any others you have felt previously. Have faith through your Higher Self and each of us that you are only going through a Rebirth process that will assist you to know yourself much deeper on the inside that you ever have in any other lifetime. The more time you connect with the energies in your breath and silence, the easier the process will be for each of you. Take time to feel the lower element within you that you want to heal, allow yourself to experience it within the lower dimensions and then access the higher existence of the light infractions of this Equinox. Write about it, feel it, breathe in the higher light essence you are and we shall be there to assist it to ground it more deeply within you. It is a time of Remembrance of the Divine Self as you do without your physical existence within your Etheric Soul Body of Light. To walk through the Gateway of Light, join Walking Terra Christa for an Equinox Ceremony with Lord Metatron within the Golden Etheric City of Havalancheeia, Monday March 19th, 2018, 4:30 PM Pacific, Click Here to Join. (P.S. Thank you for those who offer donations for these important gatherings). Related: For those who are serious about stepping into Mastery in 2018 for discovering how to accept more COSMIC LIGHT into your consciousness and physical self, Walking Terra Christa is providing Cosmic Light Quotient Embodiment Training which includes options for deeper study this year of 2018.